HIV Disease and Complications and Immunodeficiency (former Chapter 28) material has been incorporated into appropriate chapters throughout the text. This allows the material to be discussed when more applicable. Connect Question Bank – more images have been incorporated into questions found in Connect Question Bank. Instructors manual include an Overview, Learning Outcomes, and answer keys will be provided. Text is readable and accessible for students - easier to comprehend yet still maintains an appropriately rigorous level of science. For example, general vocabulary and reading level are simplified so that students can focus on learning about microbiology and the complex scientific terminology that is required. Art is vibrant, 3-dimensional, and instructional. Colors and shapes have consistency throughout and make all art more engaging and useful (for students and instructors). The art program is a great learning tool for students! Learning outcomes begin each major section. They are numbered to tightly correlate to digital course material. Instructors will be able to successfully measure student learning as it relates specifically to the learning outcomes. 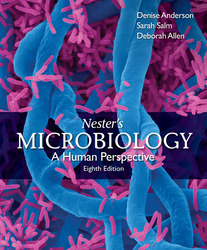 ConnectPlus Microbiology for Nester's 8e allows instructors and students to use art and animations from the text for assignments and lectures. Instructors now have access to a variety of new resources including assignable and gradable case study activities, LearnSmart, animation learning modules and more. The media rich eBook allows students to do full text searches, add notes and highlights, and access their instructor's shared notes and highlights. Figure Questions offer another assessment opportunity for students. Most figures have critical thinking questions associated with them. All major diseases are represented with a summary table that includes an outline of pathogenesis keyed to a human figure showing the entry and exit of the pathogen. Each of the disease chapters ends with a Diseases in Review summary table that pulls together key information for students. This gives them one place to find the diseases, their causative agents, any critical information and reference to the page where the disease's summary table is found. MicroBytes are found throughout the chapters. These are small "bytes" of interesting information to engage students. Perspective boxes introduce a “human” perspective by showing how microorganisms and their products influence our lives in a myriad of different ways. Many chapters end with a pending challenge (Future Challenges) facing microbiologists and future microbiologists. Over 100 animations have been developed on key microbiological processes for instructors and students. Students can now quiz themselves over each animation, receive automatic feedback on correct/incorrect answers, and then submit their answers to their instructors for grading. A special icon helps correlate over 100 total animations to the figures in the text. These animations are also available as downloadable content for portable players! There is incomparable treatment of diseases. Each Disease is presented systematically and predictably. Individual sections describe the disease’s symptoms, causative agents, pathogenesis, epidemiology, and prevention and treatment. Chapters are organized to prepare students for great foundation. They include Key Terms, Learning Outcomes, and MicroAssessments that summarize the major concepts in that section and offer both review questions and critical thinking questions. Each chapter opens with a Glimpse of History which is an engaging story about the men and women who pioneered the field of microbiology. Figures Unique to Nester! This edition contains figures addressing fundamental concepts that no other book has! Denise Anderson is a Senior Lecturer in the Department of Microbiology at the University of Washington, where she teaches a variety of courses including general microbiology, medical bacteriology laboratory, and medical mycology/parasitology laboratory. Equipped with a diverse educational background, including undergraduate work in nutrition and graduate work in food science and in microbiology, she first discovered a passion for teaching when she taught microbiology laboratory courses as part of her graduate training. Her enthusiastic teaching style, fueled by regular doses of Seattle’s famous coffee, receives high reviews by her students. Outside of academic life, Denise relaxes in the Phinney Ridge neighborhood of Seattle, where she lives with her husband, Richard Moore, and dog, Dudley (neither of whom are well trained). When not planning lectures, grading papers, or writing textbook chapters, she can usually be found chatting with the neighbors, fighting the weeds in her garden, or enjoying a fermented beverage at the local pub. Sarah Salm is a Professor at the Borough of Manhattan Community College (BMCC) of the City University of New York, where she teaches microbiology, anatomy and physiology, and general biology. She earned her undergraduate and doctoral degrees at the University of the Witwatersrand in Johannesburg, South Africa. She later moved to New York, working first as a postdoctoral fellow and then an Assistant Research Professor at NYU Langone Medical Center. Her research has covered a range of subjects, from plant virus identification through prostate stem cell characterization. When not focused on the textbook and her classes, Sarah loves to read, hike, and travel. Deborah Allen is a Professor at Jefferson College in Missouri, where she teaches microbiology as well as several other courses for students entering allied health careers. Her graduate work was in zoology at the University of Oklahoma and in neurobiology and behavior at Cornell University. She participated in cancer research at the University of Arkansas Medical Center before embarking on a career in publishing, working in acquisitions and development for books in the life sciences. She is now thrilled to be working on the other end of the desk with the Nester team. Away from campus, Deborah reads or listens to her favorite Eve Dallas novels, floats the rivers and listens to folk music in the Ozarks, and fully appreciates the local microbes while visiting Missouri wineries.